I've been working on my improv sampler, I have this much done. I need to move it to a different design area as I can't easily reach the top above my sewing machine to organize the blocks. But I do know that the space you see up to the end of the plus blocks on the far right is about what I need to fill up for a 60" square. I cut some pieces big enough to work on the part I am doing next, then I use them up, then cut some more. I am trying to decide what kind of improv blocks to make next. 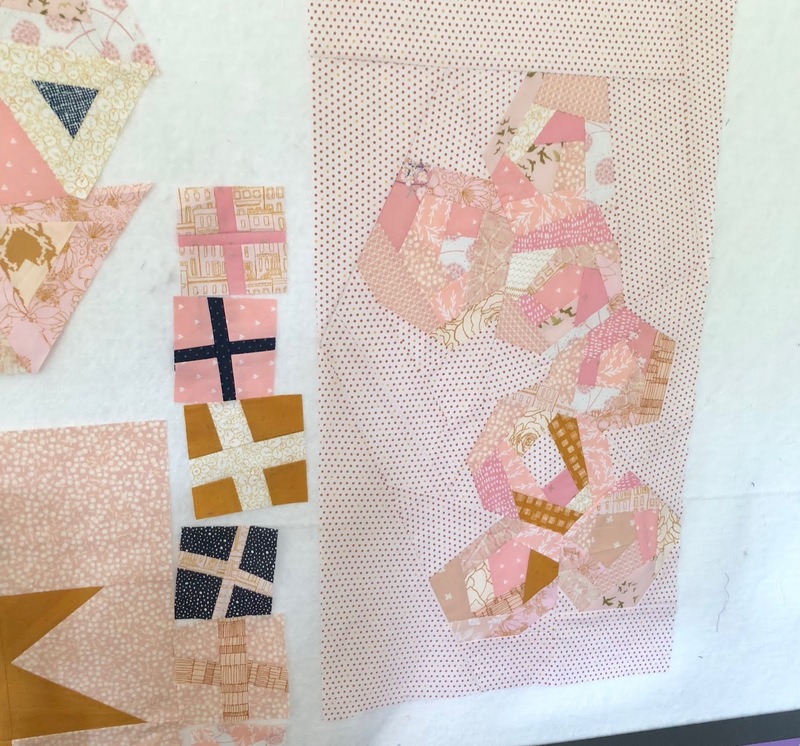 This project has been so good for kick starting my quilting creativity, as I am playing with all sorts of improv. Also, I find improv with prints challenging and the lack of contrast adds even more difficulty. So both challenging and creative. I especially like how these rosettes have come together. And the string blocks, I have always resisted making many of these but they are so easy to make, especially when you don't bother with a foundation. You just need to remember they are very stretchy because they are cut on the bias so need to be handled with care. Next time I make blocks like these, I will try to share more of the process for construction of them. 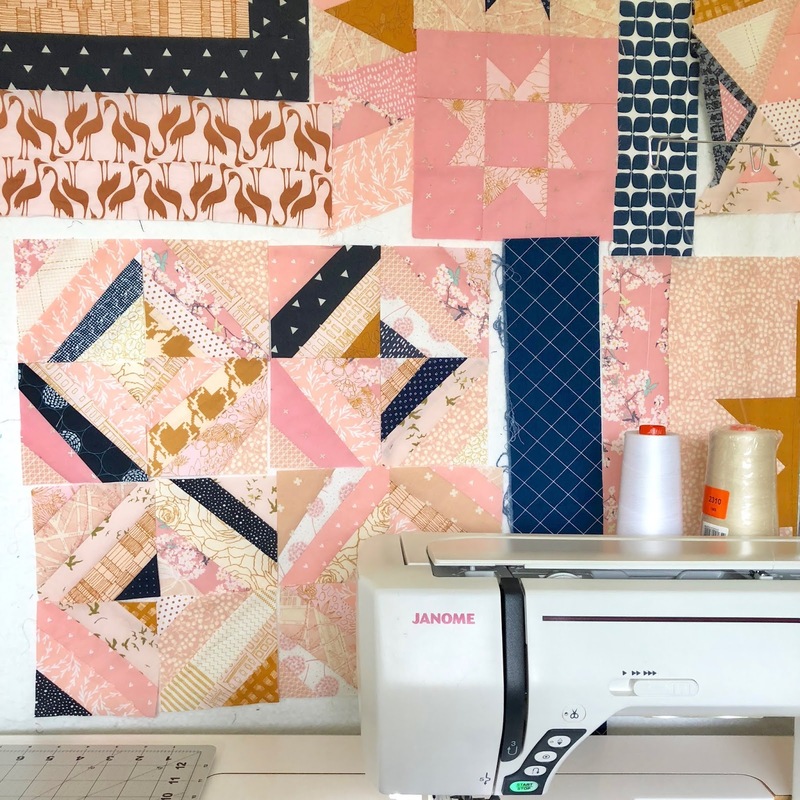 I am missing reading blogs of folks who share their quilting, sewing and knitting progress and processes. If you have suggestions of blogs, including your own, for me to consider, please leave me a note in the comments. Love how your improv is progressing. Your colour palette is so pretty with all those subtle colours and 'pops' of blue & gold for contrast. Wow, Leanne, your improv progress is fantastic! I LOVE your rosettes!! I admire your work with your color palette. You've incorporated just the right amount of "pops" for my eye! What a,fun project and I really like the cour combos. Leanne, you have been very productive and busy, I love it. I am happy you shared. You have some wonderful colors here. very soothing and beautiful. I think it is coming together - the gold and navy really make it pop. Patchwork heaven to me is working in improv. Stop on by for a visit sometime. me me! I'm a blog. But I post irregularly and my photos are... ok lol. This palette is growing on my so much. Feminine without being twee or excessively girly. 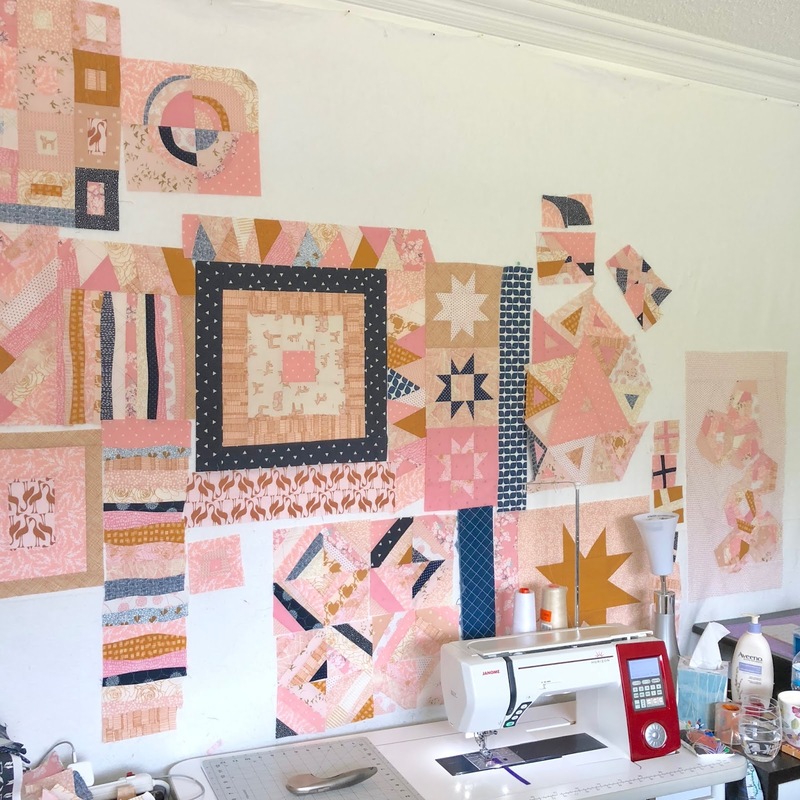 Fun to see your progress on these blocks, and enjoyable to read about the process. I read through your commenter's comments, and find I already follow a lot of these folks, but sometimes don't take the time to sit down and read and comment back. My blog, opquilt.com, still serves as my place to share my work, to write, to explore and to whine (when appropriate), and this morning I've had fun going back to my Reader to find more blogs to look at. I'll have to add some of these to my list! 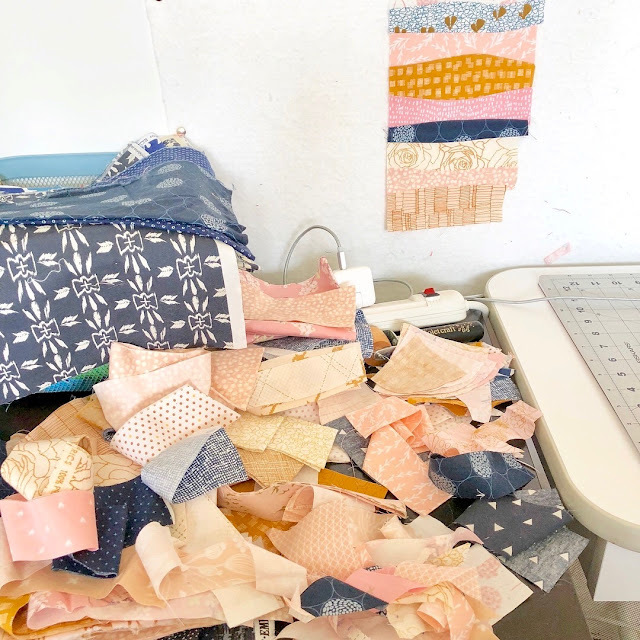 Hi Leanne: Well this is what I would like to be doing with my blog but my life has been a bit too crazy to pull it off both the experimental quilting and good blogging. I'll let you know if that changes. Do you follow Kaja at Sew Slowly? Totally process. Also you might like Dizzy Quilter as she often shares process. PS I am inspired by your improv use of quilt blocks. Everything is coming out so pretty!